Once upon a time many years ago, in 1973, there was a German chef who was famous from Sevastapol to Capetown, from New York to Bombay. His name was Nathan Georg Petrovich von Horb-Hapsburg, but everyone knew him as Chef Nathan. Nathan was short, balding, and, not surprisingly, somewhat stout, despite running several miles each morning. While there aren’t many first-rate gourmet cooks, there are many, many people who would consider a meal by a gastronomic genius like Chef Nathan “a meal to die for.” His services were, therefore, extremely expensive. His income so high that when he worked it cost him more in income tax than he earned. There were many who were unable to pay anything like the going price, even though they were clearly deserving of one of Chef Nathan’s meals. 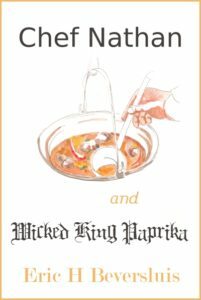 In a small kingdom in Southwestern Eastern Europe there lived King Paprika the First. The king, who had been a punishing rugby player in his student days in England, combined his power as Absolute Monarch with a malevolent countenance and his imposing size to keep his courtiers and subjects in a constant state of terror. His craving for Hungarian Goulash was the controlling passion of his life. He made war and peace, and hired and executed cooks, all for the sake of Hungarian Goulash. Naturally, King Paprika the First had been trying for years to get Chef Nathan to come cook for him. For if Chef Nathan had any one specialty, it was Hungarian Goulash. Failing initially to realize how special Chef Nathan was, King Paprika had merely fired off a telegram saying, “Need chef for party on November 29. Hungarian Goulash. Good pay.” (Back in the day there was no email or Internet!) A few days later one of Chef Nathan’s assistant managers sent a letter politely informing him that Chef Nathan was booked up for the next two years, and that he would be put on the waiting list. Infuriated by this reply, the King threw a temper tantrum and his dish of goulash. He dashed to the kitchen to gorge himself on more goulash. When the goulash no longer pleased him, and the cook could devise no variety that excited his jaded palate, he had the poor thing boiled alive in paprika sauce. Then he made war on his neighbors to the north and carried off their entire supply of paprika. Thereafter he wrote at least once a week to Chef Nathan, alternately threatening and pleading, offering him ever higher sums of money. After a while Chef Nathan’s managers stopped accepting mail from the King. Now it happened that Chef Nathan had a very peculiar habit. Whenever Nathan had to be on the road overnight, he would cook dinner for the innkeeper and a small party of the innkeeper’s friends—in lieu of his hotel bill. Most of his managers felt that this policy violated “professional ethics.” Nathan replied that what they called “professional ethics” was really just price fixing. Now Nathan was clearly paying far more for his hotel lodging (or receiving far less for his cooking) than he had to. But his father had been a hotel-keeper before being made a nobleman, and providing this favor to hotel-keepers was probably his way of honoring his father. Thus certain lucky innkeepers found themselves enjoying a meal which ordinarily would have been enjoyed only by that elite which can buy and sell nations. 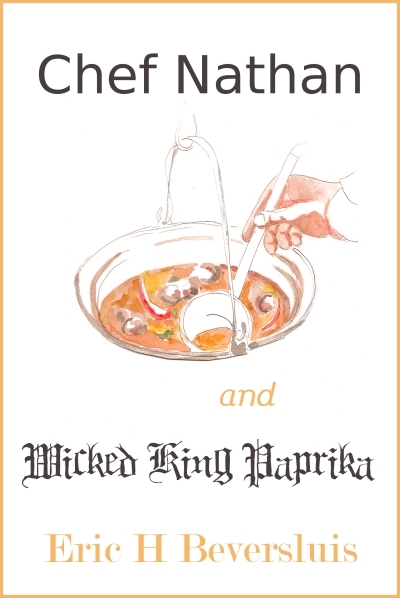 One day it became evident that Chef Nathan would have to spend the night in the country of King Paprika the First. His chief adviser said that he ought to take this occasion to fit the King into his schedule, but Nathan rejected the idea, saying that he should not slight an innkeeper just for a king. So Nathan’s travel agency began its routine investigation of the inns in that far-away land. After careful consideration of the important factors, such as accessibility to the airport, security, privacy, and the temperature of the pool, they selected Hotel Astor, under the proprietorship of David Innkeeper. Great were the jubilation and excitement when word was received that Chef Nathan would be spending the night there. David Innkeeper promptly took out a second mortgage and had the entire hotel redecorated, being careful not to alter the temperature of the pool. Greetings from His Majesty, the King. to join the dinner party for which Chef Nathan will cook. His Majesty, King Paprika the First, by the Grace of God Ruler, Sovereign, and Protector of the Sacred Pepper, regrets any inconvenience it may cause David Innkeeper and his friends; nevertheless His Majesty remains ready to accept the Innkeeper’s invitation to dinner. And again, David, now frantically trying to purchase the various rare herbs and spices that Chef Nathan’s apprentice had said would be needed, sent back word that he was unable to extend the invitation to the king—perhaps His Majesty would join them for leftovers the next day. Now King Paprika the First was really angry. He poured a scalding tureen of goulash over his First Minister and called for the Captain of the Guards, who came running from lunch without even stopping to wipe the food from his face. “Get that Innkeeper!” roared the King. “Bring him down to Tobias der Torturer and don’t release him until I get that invitation!” So the Captain was off on the run, with fifteen soldiers straggling along behind, trying to button their jackets, clean their faces, and load their World War I vintage rifles. Stopping around the corner from the Hotel Astor, the Captain waited until his men caught up and caught their breath. Then he stealthily deployed them around the building, to prevent David’s escape. Inside, David’s frantic preparations were continuing. He had just learned that Scarborough Fair had shut down, leaving him without time to find more thyme. David had forgotten all about the incident with the King, so he could not figure out what the problem was. But he had seen enough TV coverage of the 1968 Democratic National Convention and of Kent State to know that you don’t try to reason with riot police. So, hands over his head and eyes streaming (from the onions and paprika in the scullery, not from the stale teargas), David surrendered to the police. So they set off for the palace—Chef Nathan and Mrs. Innkeeper in the lead, then the Lord Mayor, then the friends and family who were to have been guests at the dinner party. (In David’s absence, Mrs. Innkeeper had planned to invite both the accountant and the wine purveyor), and finally the whole crowd of common folk, who had turned out to catch a glimpse of the great Chef Nathan and, just maybe, a whiff of the rich aroma of exotic spices that emanated from his presence. They marched through the city, up the hill, and to the palace gate, where Chef Nathan firmly pulled the bell. “Who’s there?” came the sullen voice from inside. “No,” said Nathan quietly, “Mrs. Innkeeper and the other guests will come in with me.” And he spoke with so much authority that the gatekeeper immediately let them all in. They went up to the great hall. A stove and pots and provisions were brought in. David’s cook at the hotel brought all the spices, meats and vegetables David had so carefully gathered. For three hours, Nathan cut and measured, poured and stirred, boiled and simmered. Then finally he announced that it was ready. “Bring me the King’s best goulash dish,” he ordered sharply. The dish was brought, and Nathan carefully measured out one ladle-full. “No!” shrieked the King. “I will not eat it. And you shall die for this trick. Guards, seize him!” But not a guard moved, for as he spoke, the King—as if involuntarily—rose from his throne and started for the bowl of goulash. “I can’t stop myself!” he cried. “The aroma is too delicious. I must eat though I die.” He grabbed the bowl from his horrified cup-bearer and wolfed it down. Before he could finish, the bowl fell from his hands and he collapsed on top of it, quite dead. At the moment the King died, the Captain of the Guard rushed to the dungeon, where he released David Innkeeper and the more than a score of other prisoners who were being held there. “The King is dead! Long live the Queen!” said Chef Nathan, and he turned to the Crown Princess, Princess Natalie von Kurri. Natalie, pale and shaken, moved to the foot of the throne and lifted her hand for silence.